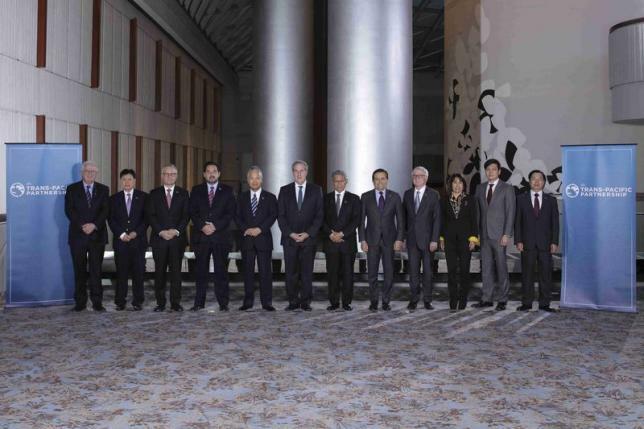 Pacific trade ministers have reached a deal on the most sweeping trade liberalization pact in a generation that will cut trade barriers and set common standards for 12 countries, an official familiar with the talks said on Monday (5 October). The deal should re-invigorate talks on TTIP. Leaders from a dozen Pacific Rim nations are poised to announce the pact later today. The deal could reshape industries and influence everything from the price of cheese to the cost of cancer treatments. The Trans-Pacific Partnership would affect 40% of the world economy and would stand as a legacy-defining achievement for U.S. President Barack Obama, if it is ratified by Congress. The final round of negotiations in Atlanta, which began on Wednesday (30 September), had snared on the question of how long a monopoly period should be allowed on next-generation biotech drugs, until the United States and Australia negotiated a compromise. Although the complex deal sets tariff reduction schedules on hundreds of imported items from pork and beef in Japan to pickup trucks in the United States, one issue had threatened to derail talks until the end – the length of the monopolies awarded to the developers of new biological drugs. Negotiating teams had been deadlocked over the question of the minimum period of protection to the rights for data used to make biologic drugs, made by companies including Pfizer Inc, Roche Group’s Genentech and Japan’s Takeda Pharmaceutical Co. The Washington, D.C.-based Biotechnology Industry Association said it was “very disappointed” by reports that U.S. negotiators had not been able to convince Australia and other TPP members to adopt the 12-year standard approved by Congress. A politically charged set of issues surrounding protections for dairy farmers was also addressed in the final hours of talks, officials said. New Zealand, home to the world’s biggest dairy exporter, Fonterra, wanted increased access to U.S., Canadian and Japanese markets. The North American Free Trade Agreement between Canada, the United States and Mexico mandates that vehicles have a local content of 62.5 percent. The way that rule is implemented means that just over half of a vehicle needs to be manufactured locally. It has been credited with driving a boom in auto-related in investment in Mexico. The TPP would give Japan’s automakers, led by Toyota MotorCorp, a freer hand to buy parts from Asia for vehicles sold in the United States but sets long phase-out periods for U.S. tariffs on Japanese cars and light trucks. The TPP deal being readied for expected announcement on Monday also sets minimum standards on issues ranging from workers’ rights to environmental protection. It also sets up dispute settlement guidelines between governments and foreign investors separate from national courts. TTP done, eyes now turn to TTIP. The EU-US trade deal has been put on hold because of accelerated negotiations on the Pacific rim. European experts hope for a revived political momentum on the Atlantic side. “We need to intensify the pace of our negotiations. That means stepping up efforts on both sides,” European Commission Cecilia Malmström said after a meeting with U.S. Trade Representative Michael Froman in Washington last month. Commenting on the public announcement of the TTP deal, US President Barack Obama said: "This partnership levels the playing field for our farmers, ranchers, and manufacturers by eliminating more than 18,000 taxes that various countries put on our products. It includes the strongest commitments on labor and the environment of any trade agreement in history, and those commitments are enforceable, unlike in past agreements. It promotes a free and open Internet. It strengthens our strategic relationships with our partners and allies in a region that will be vital to the 21st century. It’s an agreement that puts American workers first and will help middle-class families get ahead. Once negotiators have finalized the text of this partnership, Congress and the American people will have months to read every word before I sign it. I look forward to working with lawmakers from both parties as they consider this agreement. If we can get this agreement to my desk, then we can help our businesses sell more Made in America goods and services around the world, and we can help more American workers compete and win." Markus J. Beyrer, Director General of BUSINESSEUROPE, stated: “The conclusion of TPP- Trans-Pacific Partnership Agreement it’s a significant step towards trade liberalization and should bring a new impetus to the EU trade negotiations with Japan and the US. With the conclusion of TPP we are now confident the EU might be closer to conclude ambitious agreements with Japan and the US”. Marietje Schaake, co-ordinator for the ALDE group on the European Parliament's trade committee said: "It is important to see trade embedded in rules, preferably globally. I am glad that the Trans-Pacific Partnership, which had been in its final stages for a very long time, is now concluded. On the US side, this will free up valuable time, energy and political capital to invest in the negotiations in TTIP. There is no longer an excuse not to discuss even the more challenging topics." "The conclusion of TPP should also remind Europeans that we will either be driving rules and standards for global trade, or other countries will set their own standards. The EU is also in negotiation with important economies like Japan on a free trade agreement. The space for negotiation will inevitably be influenced by what Japan agreed in TPP." Guy Verhofstadt, President of the Liberals and Democrats for Europe said: "The United States and all of the other parties to this trade deal should be warmly congratulated." "This agreement underscores the vital need for a smart TTIP that reflects our values and builds on European standards. The stark reality is that Europe's share of global trade is now at stake. In order to remain a global player, the EU must now work hard to swiftly conclude the TTIP." "I have every faith in our Liberal Commissioner Cecilia Malmstrom, as she conducts the negotiations and works to improve access for EU businesses to the US market, whilst supporting European SME's. The TTIP must also deliver and set a new standard for investment protection." To Euractiv : there is a typo in the 10th parapraph. We don’t know for how long the patents are protected from competition and generics it the TPP deal. No to these bogus so-called ‘free-trade’ deals. They are only to assist large corporations to by-pass laws and increase their profit at the expense of ordinary people. Ms Maelstorm is the representative of the large corporations in the EU and the US and it is time we send this’ horse-look-a-like ‘ commissioner packing!